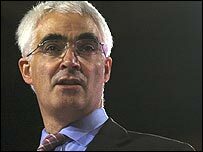 Chancellor Alistair Darling has urged Britain's banks to take a more cautious approach to lending. In an interview with the Daily Telegraph, Mr Darling said both lenders and borrowers needed to "think long and hard" about the risks involved. He also suggested a return to "good, old-fashioned banking" and voiced concern over loan consolidation TV ads. His comments come amid volatile markets and concerns about the scale of debt taken on by British consumers. The chancellor told the Telegraph primary responsibility had to rest with individuals. He said: "In crude terms [lenders] need to know who they're lending to, how much they're lending and what the risk is. "Now, that's elementary banking, one might think, but there are times when going back to good old-fashioned banking may not be a bad idea." But Mr Darling made no suggestion government would intervene with tighter regulation of lending. "My starting point is that government can't stand on the shoes of borrowers or lenders," he said. "[Borrowers] need to ask themselves, 'Can I repay this?' and lenders need to ask themselves, 'If it goes wrong, can I get it back?'. People do need to think long and hard about this," he warned. But he did say the Treasury was looking into commercials - "the sort you see on daytime TV" - which encourage consumers in debt to consolidate their loans. Experts have warned such schemes can actually push households further into debt. He added that banks themselves may bear some of the responsibility for people getting into problems with debt they cannot handle. "Institutions have in some cases been prepared to lend to people without actually checking if they were ever going to repay it," he said. He also suggested the City and financial institutions should take a more sceptical approach to new and complex financial instruments which appear to offer spectacular rates of return. Recent cases have shown such instruments have turned out to be backed by risky loans to sub-prime home-buyers in the US. He told the newspaper: "Institutions themselves need to open their own eyes and be more honest. "When someone comes up with a fantastic way of making money they need to ask, how is this money being made and what are the risks?" Mr Darling's comments were welcomed by the Consumer Credit Counselling Service, which advises those in financial difficulties. "Banks try to only lend responsibly but often they have been dazzled by the technology and forgotten to eyeball the customer," said chairman Malcolm Hurlston. "There should also be responsible borrowing but consumers can be led astray by emotions - not helped by cynical advertising on daytime television, as highlighted by the Chancellor, with for-profit providers offering minority solutions to mass problems." 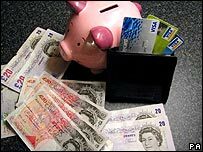 The director of public policy for Citizens Advice, Teresa Perchard, said that a campaign to inform people about better lending and borrowing habits was needed if behaviour was going to change. "The Chancellor is right to highlight the need for more responsible lending by banks and credit providers," she said. "Borrowers and lenders need to go into lending with their eyes open. The impact of unmanageable debt on individuals is severe and long-lasting. For some it means bankruptcy and years of stigma."